Deep red buds open to large, fragrant, rosy pink flowers that turn red, orange, and yellow as they mature. This brilliant color combination gives the flower a tricolor appearance. A late to mid-season bloomer. 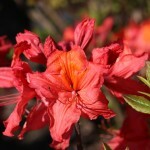 Prefers moist, well-drained acidic soil and full sun to part shade. Prune after flowering as needed.